Like any other hair-mad woman on a journey, I love watching videos on hair styles, events and any tips and tricks for styling my hair. I still haven’t ventured into the world of YouTube myself so I applaud these ladies for their bravery and know-how. 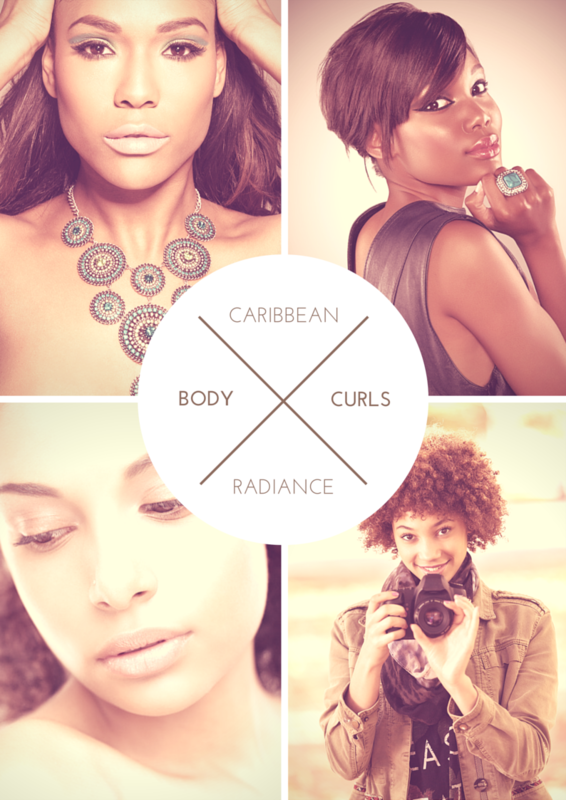 CurlTure represents accepting and embracing your culture and heritage, and in turn your natural hair. Called ‘BooyFurl’ because that’s how people from London and Essex say beautiful, Jennifer blogs about natural hair, msuic, fashion and food! Adding YouTube vlogger to her list of endless talents Peeks runs www.mo-am.com which brings everything from fashion and beauty to business tips into one place. 5. The Curly CockneyAlthough Jade only set out on her vlogging journey last year, her passion for natural hair, beauty, fashion and fitness has shone through to earn her a loyal following. FusionofCultures is your one stop shop for all things healthy hair and life inspiration. This channel started off as a final project for a Masters degree, but after getting such a positive response, it carried on after graduation. The blog hunts the country for beautiful, natural hair to point a camera at, combing England for afro culture. Based in London, Annie’s Locs revolves around natural products to strengthen, grow and revitalise hair. For the best tips of becoming a ‘kitchen beautician’, Stacey can give you the pointers you need to DIY your own haircare. Woman In The Jungle is a UK based natural hair & beauty community here to inspire, educate and celebrate the modern day woman of colour. Whether you’re after quirky or classic hairstyles, the ladies at Natural Hair Daily are encouraging others to rock their natural tresses with pride! If you know of any other great natural hair vlogs, post them in the comments below. We love hearing about new vlogs! New Products & New Sizes!!! 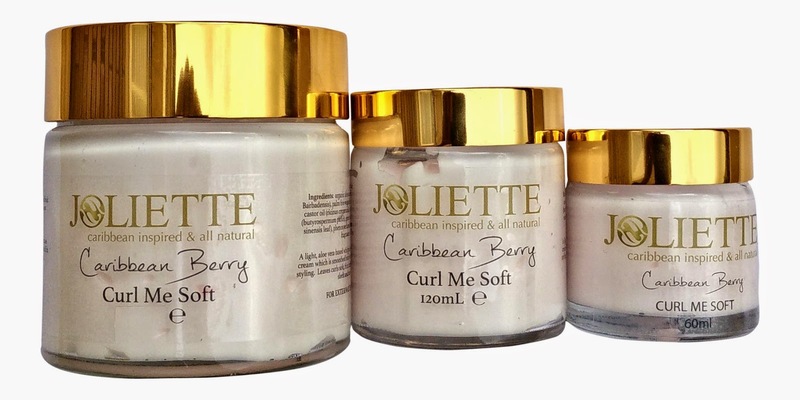 We officially launched our Joliette range earlier this year and expanded into skin and face products over the summer, like our Natural Coconut Face Scrub and Coffee Cream Cellulite Body Scrub.WSince then have expanded into skin and facial products. This quarter we are introducing new larger sizes and several new hair products for you to enjoy! Those of you familiar with the amazing Caribbean Berry scent will be pleased to learn that we have now added a Whipped Creamy Leave In (for thicker hair), a Hair Treatment Mask with Sea Kelp and a Hydrating Mist! 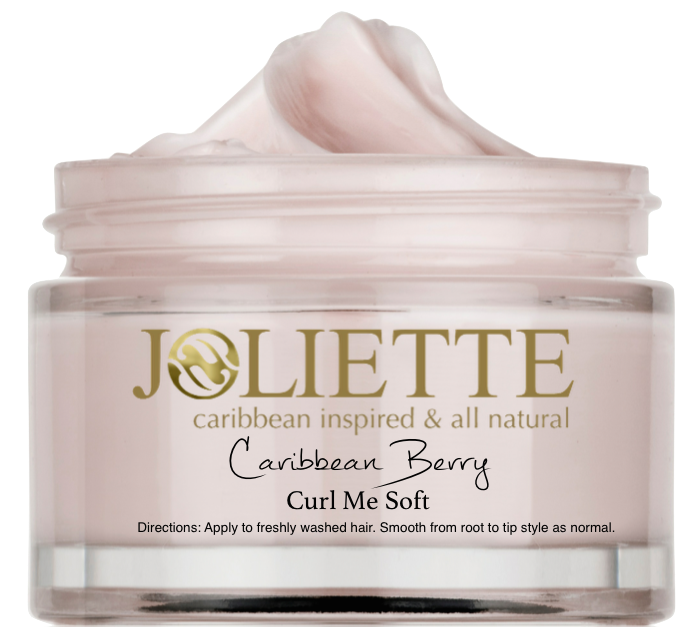 Along with having all new hair products we have increased the sizes of our Joliette Curl Me Soft and Whipped Creamy Leave In to 120ml and and a whopping 250ml! Buy Now! At AfroDeity we use the LOC method quite a bit so I thought it would be a good idea to talk a little about what this actually is. The LOC (liquid, oil, cream) method is a technique for moisturising natural hair in three simple steps. When done with the right products and in the right order, it is scientifically one of the best ways to moisturise natural hair! The method consists of hydrating the hair with water (the liquid), sealing in the moisture with oil and then applying cream to close the hair cuticle, preventing moisture loss. 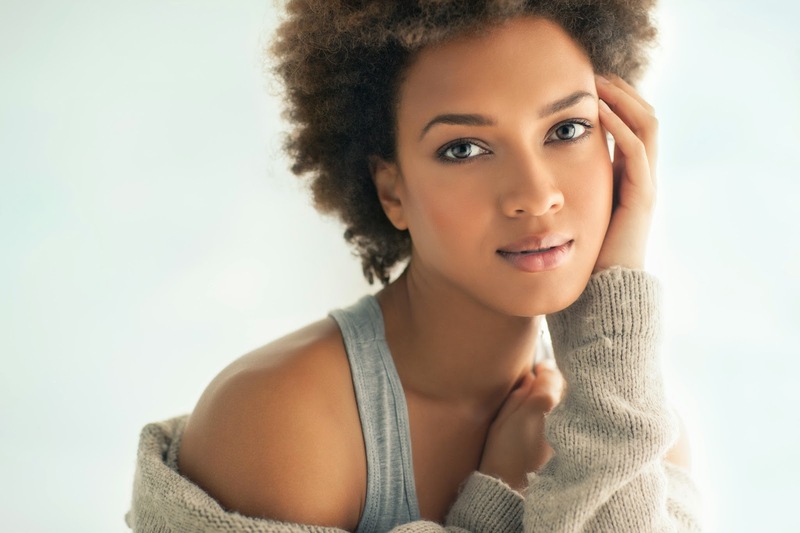 Women with natural, curly hair - which is constantly crying out for moisture - could find that this method ends all their woes. Firstly, and most obviously, water is moisture. We all know that adding moisture to your hair when you wash it gives it a boost, but the issue is locking that moisture in! The next step is oil. If you think it sounds a little incompatible to mix oil and water, you’re not alone, but in fact many natural oils are able to penetrate the hair shaft and bind with the hair internal structure or protein. 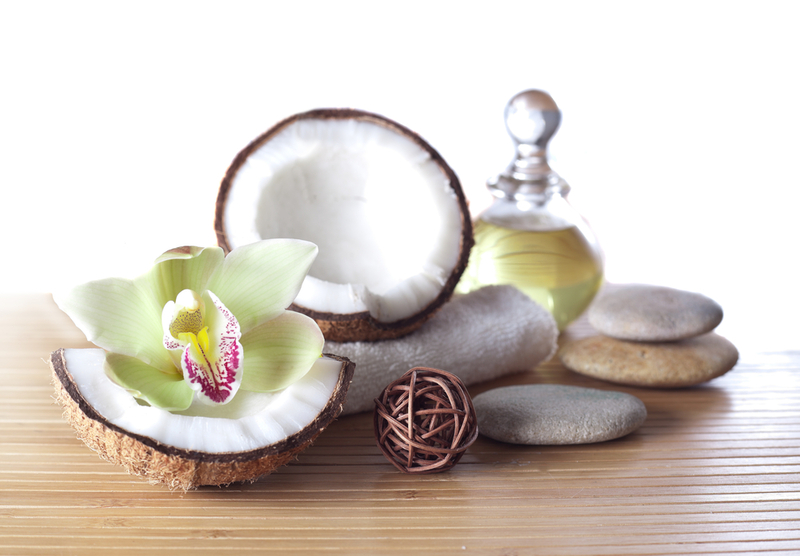 The top three kinds of oil for the LOC method are coconut, olive and avocado, which are brilliant at holding onto the water molecules for dear life, and you only need a thin layer. Finally, the cream locks in the moisture. The most important thing is to make sure that your cream is moisturising and acts as a sealant. The word cream can be misleading, however, as many natural products such as castor oil, grape seed oil and jojoba oil act as sealants too! Just as we start to layer up our clothing for the winter months to seal in heat, the layering up of products in the LOC method ensures maximum moisture retention, keeping your natural hair shiny, strong and moisture rich! 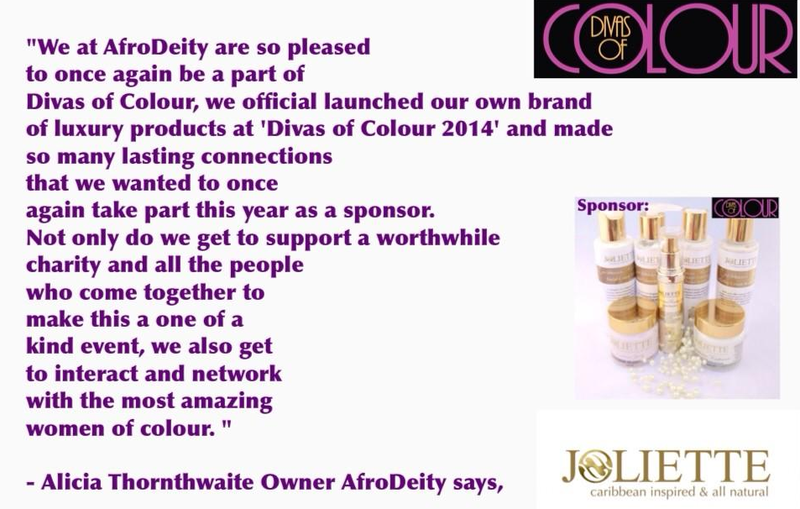 AfroDeity Sponsors Divas of colour 2015. Divas of colour International women's day 2015 receives yet another boost with a major sponsorship from AfroDeity Ltd.
Faustina Anyanwu the founder of Divas of colour says, "again, we're very much delighted and encouraged by this sponsorship from one of our first exhibitors on Divas of colour's first outing. Seeing a brand that was launched on our platform grow this big and coming for the second time to be a part of the event is a great boost. It goes to say what we're doing is viable and a welcomed initiative. I'm exceptionally thankful and excited at the same time to have AfroDeity especially the CEO Alicia, a very beautiful woman heart and soul. Divas of colour is all about discovering the best of women of colour and in just 2 editions, we're beginning to make the right marks." In the deal, AfroDeity has promised to give sponsorship directly to the Diva Face (Pageant) category of the event. Giving a one year brand ambassador deal to the Diva face winner. Diva face pageant is a different approach to helping young women of colour to begin to love themselves as they are. On Diva Face, it's not only looking for a beautiful face, rather, the competition is looking for strong, talented, focused and young women with vision that will be worthy to represent the woman of colour on any stage in the world. It goes beyond physical beauty. AfroDeity will not only provide cash prize for the winner, but will also support the runner ups with product giveaways. "I'm particularly excited for the models and young women who will be taking part on this second edition come March 2015. They thoroughly have so much in stock for them." - Georgia , Event manager. The company AfroDeity is an online based retailer of natural Caribbean Inspired hair and skin products, whose ultimate goal is to help small farmers in the Caribbean reinvigorate the declining agricultural industry to stop a dependence on importation of essential foodstuff. 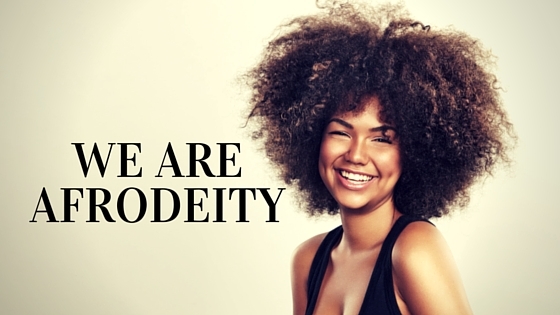 AfroDeity was founded around the knowledge of healing herbs, oils and butters passed down through the generations and culminating in a great interest in science. As such combining beauty, science and a commitment to the rural Caribbean. "We at AfroDeity are so pleased to once again be a part of Divas of Colour, we official launched our own brand of luxury products at 'Divas of Colour 2014' and made so many lasting connections that we wanted to once again take part this year as a sponsor. Not only do we get to support a worthwhile charity and all the people who come together to make this a one of a kind event, we also get to interact and network with the most amazing women of colour. " Divas of colour International women's day is the largest gathering of world's most powerful women of colour from around the globe. A special day set aside to celebrate, recognise, reward, and discover the best and contributions of women of colour. The annual event commemorates with world's International women's day every March, though may not necessarily be on the 8th of March. The event comprises of Day section of Trade show and exhibition and the evening section of fashion show, pageant and award ceremony. It is so spectacular that it captures the imagination of all women of all ages, colour, class and status. An inspiring day of self discovery and appreciation for women in general. Rosemary oil is popular world-over for a wide variety of health and beauty benefits. From boosting mental activity to relieving reparatory problems, rosemary oil has become increasingly important in plenty of people’s beauty regimes. 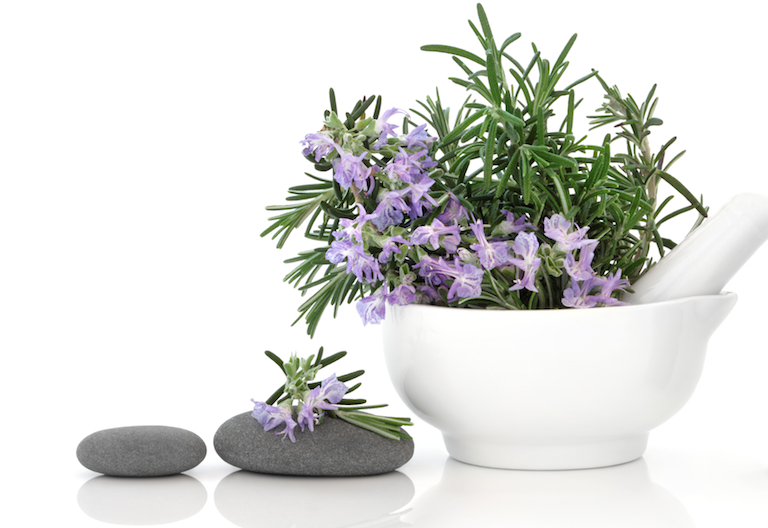 Rosemary oil is known to stimulate hair growth and prevent hair loss the natural way. This is ideal for those hoping to try and grow their tresses a little more quickly or for those men and women who may experience hair loss at different phases of life. Research conducted by the University of Maryland Medical Centre confirmed what has been known for centuries, that there is a close link between rosemary oil and hair growth. You only need to use a small amount of rosemary oil to see the benefits. You can add a few drops of Rosemary Oil to your favourite carrier oil (for example Jamaican Black Castor Oil) and this can be massaged onto your scalp. So there’s a reason why many of your favourite shampoos and conditioners contain rosemary oil or extract, as the use of these helps to stimulate the hair follicles, resulting in stronger and longer hair! By regularly massaging the scalp with rosemary oil, you can also fight off the symptoms of a dry and flakey scalp and banish dandruff! 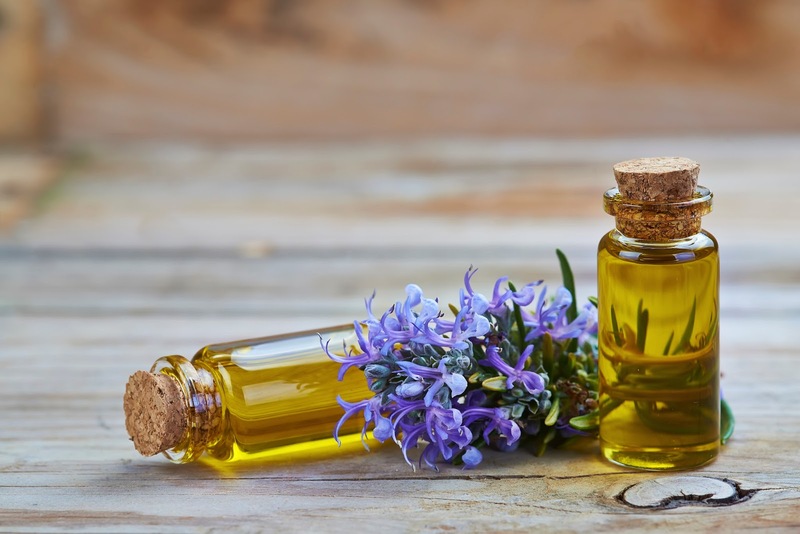 Besides haircare, rosemary oil has been found to be excellent for your brain, and is often used by students during exam times to increase concentration - inhaling rosemary oil seems to lift your spirits immediately! Give your hair and mind a jump start by taking advantage of the natural benefits of rosemary oil, and it’s stress-relieving properties will give you a break too! Whether you’re a Caribbean native, or just visiting, you’ll have been hard pushed to to miss the guava fruit, which grows in abundance all over the region. Whilst guava is mostly known for being an incredible source of vitamin C and fibre for dietary reasons, it can also work wonders for your hair! Because of the high level of vitamin A, vitamin C, folic acid, potassium, copper, manganese, fibre, flavonoids and other phytochemical, guava is extremely beneficial both for hair growth and maintenance. 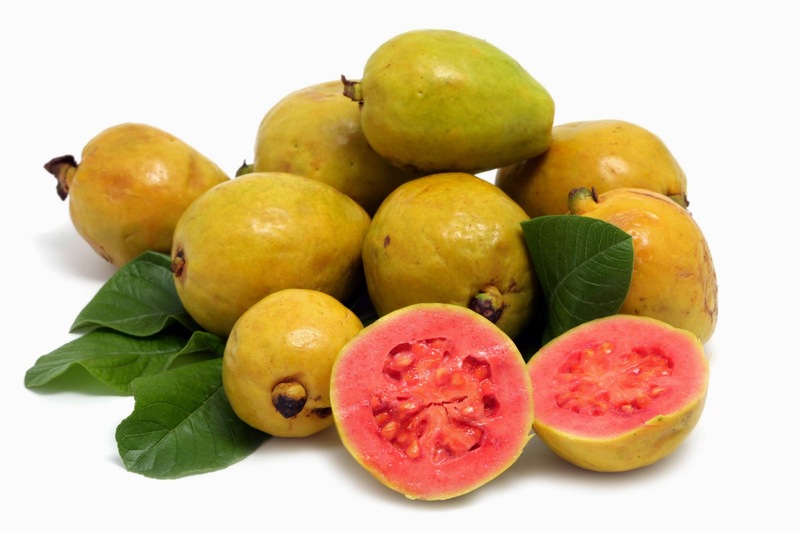 In fact, guava has been long used by herbalists to gently cleanse delicate strands of hair. Feeling as if your hair could use some extra va-va-voom? The fibre in the fruit encourages bounce and volume, to make the hair look and feel thicker and luscious. And if you like to show off your individuality with colour or highlights, the fruit being chock-full of vitamins A, B and C helps slow down the oxidation of cells, leading to colour treatments and highlights lasting much longer and staying vibrant! Finally, we all struggle with those fly away hairs. It doesn’t matter how much product you use, those free radicals keep popping out of place. Guava is the ideal solution to this problem, by using the contained carotenoids to fight the stress and environmental pollutants that cause frizz. The fruit isn’t the only part of the plant that can be used either, as guava leaves are known to combat hair loss. Boil a handful of leaves in a litre of water for 20 minutes, let it cool, then apply to your scalp in a rigorous massage. You can’t always prevent hair loss, but taking positive, natural steps to fend it off is always a good step. 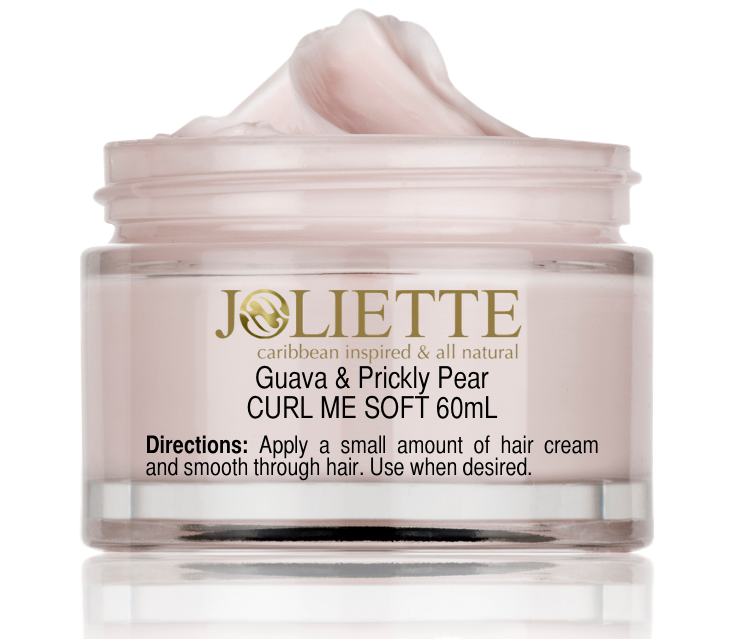 Get started with guava with our Joliette Curl Me Soft in Caribbean Vanilla, which includes guava extract and prickly pear seed oil, to leave curls soft, frizz tamed and locks looking sleek and sassy. The Caribbean Vanilla range also includes a Nourishing Shampoo, Conditioner, Hydrating Spritz and Whipped Creamy Leave In.